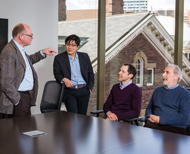 The Law and Philosophy group at the University of Toronto is widely regarded as one of the most important cadres of legal philosophers in North America. The work of these scholars affects a wide range of issues in the law and in many other disciplines. Prof. Malcolm Thorburn, public lecture at the Goethe University Frankfurt, "Criminal Law and the Promise of Self-Government"
Prof. Arthur Ripstein, Society for Applied Philosophy Annual Lecture, King’s College London, “Reclaiming Proportionality” and also related interview. Prof. Arthur Ripstein, Third Annual Lester Kissel Lecture in Ethics (Harvard): "Perpetual War or Perpetual Peace?" Prof. Larissa Katz discusses the idea of ownership in a digital age with Steve Paikin on TVO's The Agenda, in "Do You Really Own That?" Prof. Arthur Ripstein on CBC radio's Ideas: "Talking Philosophy: War and Peace, Part 1" and "The Truth About Lying"
The Spring 2005 issue of the law school magazine, Nexus, focused on the theme of Law and Philosophy. What is “the philosophy of criminal law”? Some scholars see it as a branch of political philosophy, others as applied moral philosophy. Some see it as concerned with questions of legitimate authority, focusing on the fundamental distinction between criminal justice and criminal violence. Others see it as flowing more generally from the best justification for the administrative state and what that justification requires of regulations. Regardless of these differences, criminal law philosophers are united by their quest for the deepest understanding of criminal law, criminal punishment and criminal justice.